Mine is a mixed marriage. My husband loves the beach. I love the city. And the kids love adventure. So this year, we decided to vacation in Charleston, SC. We toured the sites in the morning and hit the beach in the afternoon. Perhaps the best part of this metro area is its versatility. We rented a condo on Isle of Palms, north of the city, so my husband enjoyed his ocean view while, in less than twenty minutes, I could stroll sidewalks. 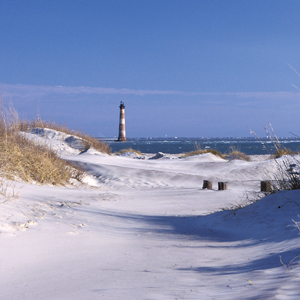 My friend, Bonnie of Providence Forge, prefers to stay in Folly Beach, an island to the south, and when another friend, Carrie of New Kent, visited Charleston last spring break, she chose a hotel downtown. With average temps in the seventies through Thanksgiving, a holiday visit might be just the ticket. The possibilities are endless. Even though historic Charleston is only three square miles, I knew my children wouldn’t enjoy meandering through the district as much as I would. 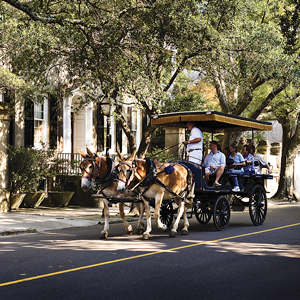 That’s why we began our sightseeing experience at Palmetto Carriage Works, located in the heart of the Charleston City Market. After perusing four blocks of open-air buildings and admiring countless sweet grass baskets, we boarded one of the covered mule-drawn carriages. This one-hour tour proved to be a wonderful way to take in the amazing architecture South of Broad while covering a lot of ground. Our guide was a wealth of information, providing not only a comprehensive introduction to Charleston’s three hundred-year-old history but also sharing fascinating anecdotes about the people who once called this affluent neighborhood home. Eager to get a peek inside one of the gorgeous homes featured during the carriage tour, I chose the Nathaniel Russell House. A tourist could spend the entire day simply taking in historical homes, like Aiken-Rhett House, Heyward-Washington House, and Joseph Manigault House – all of which are open for public viewing. I opted for the Russell House, which is widely recognized As one of America’s most significant neoclassical homes, because it contains a rare two-story freestanding staircase. Since Nathaniel Russell, like many wealthy Charleston businessmen in the eighteen hundreds, engaged in the slave trade, my next stop was the Old Slave Mart Museum. This auction site had been purposely constructed in a very respectable quarter of the city – near St. Michael’s Church, the courthouse, and the theological library – in an attempt to promote the acceptability of the practice to the Charleston city folk who were far less likely to own slaves than their agrarian counterparts. While the showroom doesn’t make the Impression it could since a second fl oor with interpretive displays has been added, learning about the lives of the enslaved blacks who passed through this building was a powerful experience. With 300 years of pirate, patriot, and presidential history, the Old Exchange and Provost Dungeon is also an interesting site. I was eager to visit it to complete my Declaration of Independence trifecta, as it’s one of the three places where the constitution was ratifi ed. (Boston and Philadelphia are the others.) The guided tour of the dungeon is great fun for history buffs of both the Revolutionary and Civil Wars, for it really exemplifi es Charleston’s diverse past. While we didn’t make it to Fort Sumter, the place where the Civil War began, my friend, Bonnie, says, “My boys loved that the cannons are still there.” Having traveled by boat from Patriots Point Naval and Maritime Museum in Mt. Pleasant, Bonnie also says, “We loved the view of Charleston and the new high-rise bridge.” Visitors can travel from Liberty Square in the Charleston harbor as well. If history alone fails to fascinate you, the city affords you with the opportunity to tap into your creative side. Gibbes Museum of Art is about the size of the old VMFA, which means seeing the entire space is manageable for a family in a couple of hours. The permanent exhibit uses art and artifacts to tell the story of Charleston from Colonial times through the present. Family guides are available at the entrance, engaging children not only with the traditional scavenger hunt but also opportunities for their own creativity. A cell phone audio guide is available for adults as well. What appealed to me most, however, was the modern twist the temporary exhibits brought to the Southern experience. Mary Whyte’s paintings of the Working South were the most beautiful watercolors I’ve ever seen. We decided to visit Boone Hall, America’s most photographed plantation, and when we saw the stunning oak trees lining the three-quarter-mile entrance, we understood why. The current plantation house, built in 1936, sits on 730 acres of farms and preserved wetlands. With nine of the original 27 slave shacks still intact, visitors get a real sense of what plantation life was all about. While once known for cotton and pecans, Boone Hall was also the areas major brick producer, supplying such Charleston places as the Provost Dungeon. Since it’s one of America’s oldest working plantations, the fields designated U-Pick provided us with the opportunity to harvest strawberries and blueberries from the same fi elds generations of slaves once worked and provided my husband and I with the opportunity to talk to our elementary school-aged daughters about the institution of slavery. Finally, one of the area’s top family attractions is the South Carolina Aquarium. Home to an albino alligator, we couldn’t resist a trip to this state-ofthe- art facility. In the beautiful Charleston harbor, the aquarium is set up a lot like the Virginia Living Museum, covering the different water habitats of the region. One of the highlights was feeding shrimp to the stingrays. However, my daughters also loved seeing the lemurs in the new exhibit featuring the wildlife of Madagascar. Eco-tours at Morris Island, Cypress Gardens, and Cape Romain National Wildlife Refuge were on my list of recommendations from friends, but we simply ran out of time to enjoy these natural beauties. 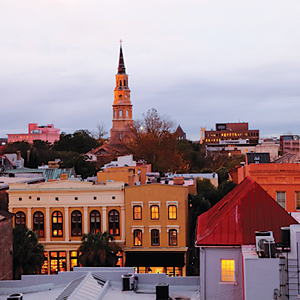 Although this metropolitan area can be pricey in-season, Charleston’s wealth of activities and attractions mean even in the fall and spring, it’s the ultimate surf and turf destination. Another trip is in our future. How about yours?